The hotel deal offers you a two nights accommodation, a balanced breakfast buffet, parking spaces at the hotel and a dinner at our restaura nt. 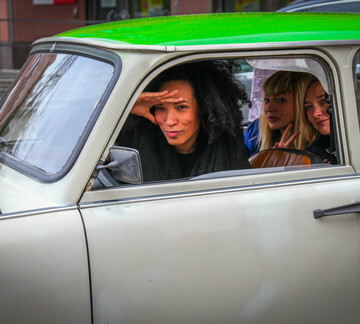 Enjoy a guided Trabi Tour, you will have endless possibilities to discover the German capital! The reservation for Trabant tour is possible from 3 persons. True to the hotels' motto "Sympathic East - Berlin" we built this hotel deal in Berlin East for you. The hotel deal offers a two nights accommodation, a balanced breakfast buffet, parking spaces at the hotel, a free room upgrade and you will enjoy a dinner in our restaurant. You have great opportunities to discover the capital of Germany, Berlin and the possibility to take some pictures with the iconic Trabi car.